This program juxtaposed aspects of traditional Japanese musical aesthetics through the medium of newly composed works for Japanese instruments and percussion. The works on the program reflected several elements of Japanese culture including Zen Buddhism, haiku and tanka poetry, and the annual celebration of cherry blossoms. Hanami is the word for a long-practiced Japanese tradition of welcoming the cherry blossoms of in springtime. Communities often gather under blooming cherry blossom trees and ponder their evanescent beauty. The program included two works inspired by Zen Buddhism. John Lane’s Uji for solo snare drum and spoken text reflected on the teachings of Eihei Dogen, founder of the Soto school of Zen. John Cage’s Ryoanji was a sublime work that musically represents the raked sand and stones of the Ryoanji temple garden in Kyoto. 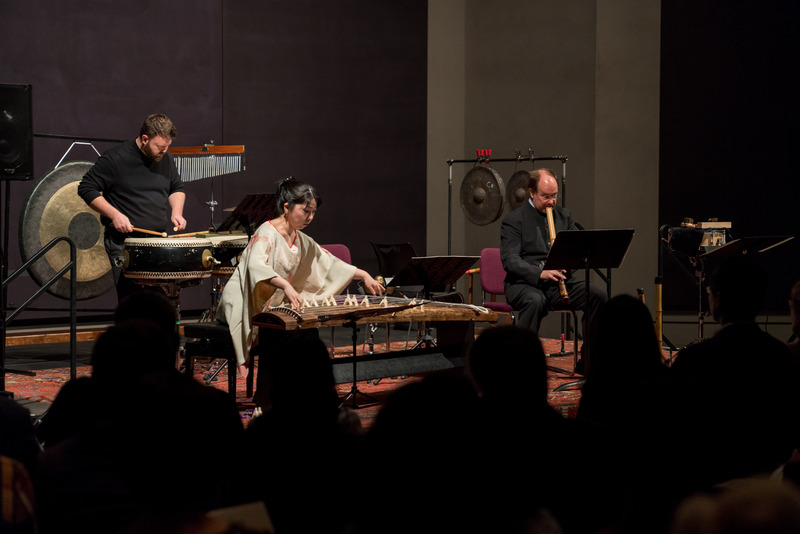 The program concluded with the premiere of a new work by Marty Regan for koto (13-string Japanese zither), shakuhachi (end-blown Japanese bamboo flute), and percussion entitled In a Moss Garden.